Athol Dickson is becoming one of my favorite novelists. Last year, I did a review for his Lost Mission novel and I throughly enjoyed it. Now, I’m doing a review for his latest novel, The Opposite of Art. Also, he is the first novelist I’ve done a second review for on my blog. The Opposite of Art is the story of the genius artist, Sheridan Ridler, who is known for painting nudes without faces. Ridler got quite a reputation in the art world as a cad to the ladies and an arrogant jerk to everyone else that came in contact with him. Well, he has an accident at the Harlem River and that begins his spiritual transformation. However, the art world thinks the great artist is dead and Ridler’s paintings are worth millions. But there are reports that he’s alive and his daughter (whom he never met) from one of his models decides to search for him. Because of her search, the daughter attracts another individual from Ridler’s past who wants to make sure the great artist is dead….and if not, stay dead. In lesser hands, a story like this could have fallen victim to stererotypes and the spiritual transformation would have been a “Come to Jesus Moment and Now I Have A Get Out of Hell Free Card.” However, Dickson creates a story of intrigue, love, murder, family relationships, and the collision of art and faith. He goes beyond the stereotypes to produce a novel that has depth and reveals the honest struggles of someone trying to come to terms with their spiritual conversion. Because of that, Dickson has become one of my favorite novelists. He seems to understand that being a believer is not just about saying the sinner’s prayer, attending at church once a week, and singing Jesus loves and forgives me songs. A spiritual conversion affects every area of our lives and this type of fiction should reflect that and not simplify it for mass consumption. In both novels I’ve reviewed, Dickson has given the Christian Fiction genre a fresh and honest perspective of what these types of novels should look like and he deserves to be mentioned with writers that preceded him like Walker Percy, Flannery O’Connor, and Graham Greene who expanded the genre’s boundaries as well. 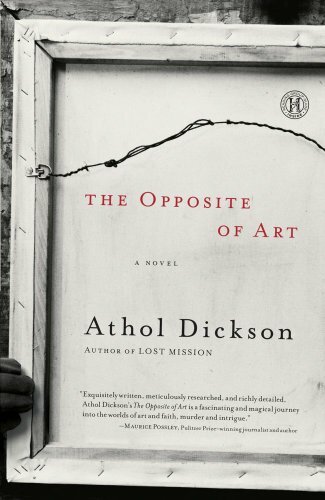 The Opposite of Art should be a must read for all serious readers and is one of the best novels I’ve read in 2012 so far. One of my favorite blogs, by author and pastor, Mike Duran, attempts to answer that question in one of his most commented posts on the blog. I will highly recommend you checkout his blog and I promise will it make you think. With that in mind, I believe Athol Dickson’s Lost Mission is an excellent example of Christian Fiction is and can be. –A woman from Mexico decides leave her home and come to America to convert everyone into becoming Christians. –A minister fresh out of seminary decides to start a ministry amongst an illegal alien community in Southern California. A rich Christian man whose wife left him for his church’s Sunday School Teacher and lost his daughter in a car accident decides to build a Christian city to shelter its citizens away from sins of the secular world. Three Franciscan priests from the late 1770’s along with Spanish explorers in Southern California decides to convert Native Americans into becoming Catholics. Well, one of the priests creates a painting which connects them to the present day. All of these elements come together in Lost Mission. I won’t give it all away, but there are some interesting questions that the novel tries to address. It is more authentic to be a poor Christian than a rich Christian in order to advance the kingdom of God? If you decide to follow God’s call and it looks like everything you tried turned out to be a failure, do you still believe that God called you? Can Christians protect themselves from the world’s influences by building their own cities? And is that a wise thing to do? What is the best way to go about converting people from paganism? Is it by force from exploration or conquest? Is it by befriending them and incorporate some of their customs? Or is their another way? Lost Mission doesn’t give any easy answers to those questions the author addresses in the novel. I deeply appreciate that and it made the story more authentic and believable. My only quibble with the novel was transition between the past and present story lines. But, once I got the hang of those transitions it didn’t bother me as much. This is a fascinating read and highly recommended. 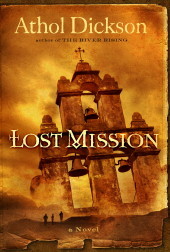 I believe Lost Mission shows what Christian Fiction can be at the highest levels.